Take Your Dog to Work Day (TYDTWD) will take place all around the world on Friday the 23rd of June 2017. TYDTWD was created to celebrate the companionship dogs provide and, and just as importantly,- to encourage adoptions from rescue groups and local shelters. On this special day, employers are asked to open their businesses to pet dogs to promote the benefits of pet ownership and encourage the adoption of animals. Are you going to participate and take your dog to work on June 23rd? Here's why we think you should. 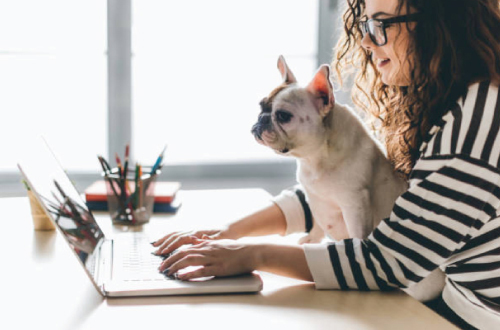 There are a number of physical and mental health benefits associated with bringing your canine companion to your work. Yep, that's right. 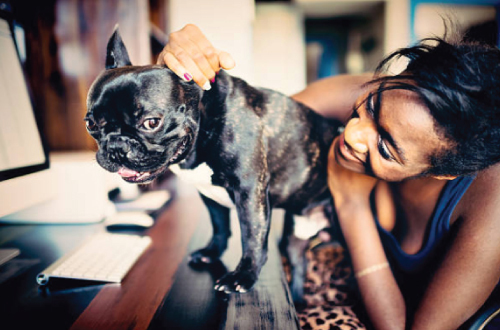 Both workers and dogs in an office environment can be a very positive experience. However there are a few guidelines that should be followed before allowing your pooch to join you at work. 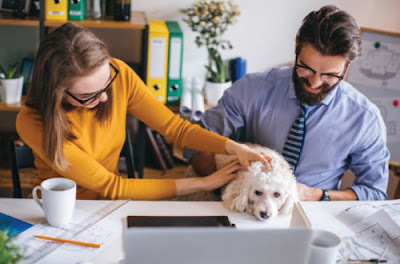 Here are some tips for the special day, three key benefits taking your dog to work can bring you, as well as how you can work on convincing your boss. Ensure you check with the entire office that it is appropriate to bring your dog into your workplace and that it will not affect the health and well-being of your fellow co-workers. Unfortunately, some work environments may not be safe or fitting for dogs. If this is the case you could plan an alternate celebration with your co-workers such as a meet up at the park. Make sure your dog has been micro chipped, wears an ID tag and is up to date with all needed vaccinations. Your dog should only enter the workplace if they have been well socialised with other dogs and people and do not have aggressive tendencies. Take your dog’s favourite things with you, including their bed, blanket, toys, food and water. This will help them to feel comfortable in the new environment and preoccupied while you are working. However, keep an eye on their belongings to ensure they don’t become a tripping hazard. Dogs should stay at the work area of their owner, or if needed, another chosen persons’ work area. Depending on the behaviour of the specific dog, they may also need to be tied on a leash to their designated area for the day. This will ensure they can’t go wandering off to possible unsafe or unsuitable areas. When you first arrive at work with your pooch, ensure you allow some time for them to meet and greet with other dogs and your co-workers. Allow breaks in the day to take your dog to the toilet and on small walks. Be prepared to clean up after your dog. Accidents may occur in new environments due to excitement and from being confused. This can be minimised with frequent toilet breaks; however, accidents may still occur and if they do, ensure you do not punish your pooch. Keep your dog out of kitchen areas. If they do happen to enter the area, have treats on hand and lour them back, rewarding them when they come to you. Reward your dog for their calm behaviour in the office. They will more likely continue to behave if they are rewarded for their behaviour. Dogs in the office increase opportunities for exercise, giving dog owners an excuse to get out of the office take a walk. It has been proven by research that remaining seated for long periods of time is bad for your health and can be linked to obesity, type 2 diabetes, some types of cancer and even premature death. It has been discovered that most adults spend more than seven hours per day sitting or lying. Therefore, taking regular breaks away from your work station is a very important part of your day. This is where your dog comes in handy. They are a constant reminder for you to get up, stretch and to take a break from your screen. If you frequently find yourself in need of a mental breather in the office then you may just need you dog. Petting or playing with an animal can boost levels of the stress-reducing hormone (oxytocin) and reduce production of the stress hormone (cortisol). A study conducted on workplace health management discovered that access to dogs creates a calming influence and reduces the levels of stress. This included a person having access to their own dog or another person’s dog. A study conducted at the Virginian Commonwealth University focused on a manufacturing company that allowed their employees to bring their pets to work. 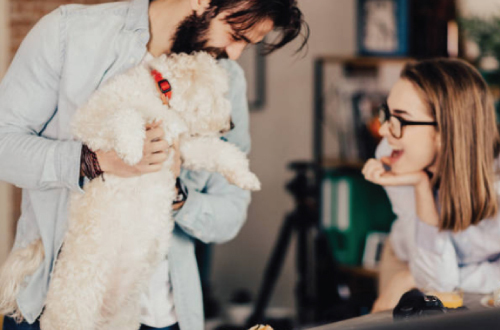 Lead author of the study, Randolph Barker praised dogs for their positive impact on the workplace which they found boosted confidence and the performance of employees. He compared the differences of stress between days when a dog was and wasn’t at the workplace, discovering that there was a significant difference with the majority of employees being much more satisfied with their jobs on day dogs were present. 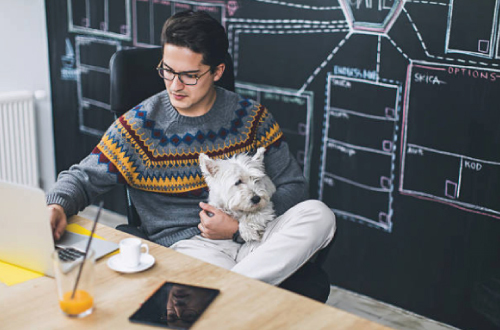 Taking your dog into the workplace isn’t just benefiting you – it’s also benefiting your pooch! Their day at work will assist in developing their confidence in public and social interactions and exercise them mentally, which is equal of importance to physical exercise. If your boss is sitting on the fence about letting you and your employees bring your dogs to work for the day consider sliding these points into conversation. Remember that bringing your dog to work day is all for a good cause, promoting the adoption of dogs from shelters and to thank your pooch for their companionship. Dogs in the workplace can bring so many physical and mental benefits to you and employees. Each year, media outlets from across the United States and abroad contact Pet Sitters International, creator of Take Your Dog To Work Day®, to request to be connected with participating businesses. If your company will be allowing dogs at work on Take Your Dog To Work Day (or anytime during Take Your Pet To Work Week™, June 19-23) and you would like the media notified about your participation, complete this form. Let them read this articleThis article contains everything you need to know about bringing your dog to work day and what the point of it is. So remember to save the date and bring your pooch to work on Friday the 23rd of June!